It's time to take a trip back to the 1800s, an age of time when the Napoleonic era and the rise of many colonies took place among various empires. History isn't easy to trace with certain origins but Jojo's Bizarre Adventure has its origins traced back with its original series. The fantastic journey finally begins! Yup, it's here and and this series suddenly is one hell of an anime that will not only bring some nostologia but excitement to you. Join Jojo Joestar and his many bizarre adventures as he embarges on a journey and learn about the wonders of the world. Jojo's Bizarre Adventure (2012) is a reboot in the title of the same name based on a collection of manga written by Hirohiko Araki. He has also collaborated in other works but Jojo is his most famous presentation. The series picks up its way from the 19th century focused on Jojo Joestar and...his bizarre adventures as he fights equally bizarre adversaries. I have not read or seen the original series but this reboot has made a strong impression on me. 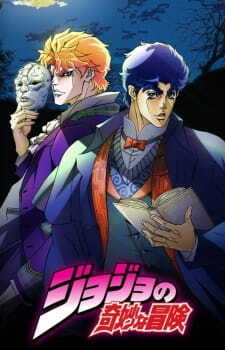 The premise of the series is based the Joestar family. He is the titular character and judging by the title, the adventures are based on his experiences. To me, I consider this series to be a classic, nostalgic, and exhilarating tale. It is nostalgic because the period of time the series takes place. Think about it: the 19th century. It's a time when technology is nothing compared to what we have today. Everything is realistic, artistic, and presented in a natural form. This setup is quite lucid and easy to understand with even new viewers to anime. Hell, if I could understand it, anyone probably can. The story starts off well and immediately wastes no time getting to the drama. In fact, we are already introduced some intense rivalry between Jonathan Joestar (Jojo) and Dio. It gets to the point and doesn't push itself to make any surprises. Well, I for one was surprised by how well the series executed its starting points and made a strong impression on me. On the surface, viewers can clearly see that Jonathan Joestar (Jojo) is a nobleman with a heart of gold and cares others above his well-being. This is proved through his actions, words, and his way of helping out others. He is also seen as a tough fellow who doesn't let anyone push him around, especially Dio. This clearly sets up the rivalry between Jojo and Dio as the two seems to be on the opposite side of things. We already know that Jojo is a noble man. However, Dio is far from that as viewers can see him as a selfish, impure, and ill-mannered individual. His behavior, dialogue, and actions makes him a dangerous adversary as he not only has the physical prowess but aptitude and brilliance to match his capacity. This combination makes the rivalry that more exciting. To add onto to the drama, we also have a love interest. Unfortunately, events becomes inevitable as a seemingly potential romance is ruined by Dio. Talk about being a spoiled brat. It is quite intense to watch the drama between the duo especially when we see the clear gap between the the two. It's almost like David vs. Goliath as Jojo plays the role of the underdog. Beyond the rivalry, there also exists a mysterious object that can seemingly turn the tide. It is a mysterious mask that seems to have ancient powers. These powers manifests by the spills of blood which leads to devastating results. It's definitely fun and exciting to see how far the rivalry will take now given that lives are also at stake. The story focuses on this mysterious object and among other artifacts later on. In fact, the story itself is actually divided into two separate arcs that follows a different generations of Jojo Joestar. The first arc known as Phantom Blood details on the rivalry between the duo. The second arc marks a glorious adventure starring Joseph Joestar (a descendent from the previous storyline) along with a new friend. Together, they embark on an adventure like never before taking on adversaries, improving themselves, and learning about the world and its wonders. In terms of the story, I found both arcs presented quite well. The first arc, also known as Phantom Blood, starts off in an explosive and dramatic action detailing the intense rivalry between Jojo and Dio. On the other hand, the second arc (known as Battle Tendency) follows on a more adventurous tale in contrast to Phantom Blood. We meet the next descendent of the Jojo generation. He meets Caesar and although their relationship starts off like oil and water, over time, the duo gains mutual respect for one and the other. Unfortunately though, there is more conflict than just that as a trio of powerful antagonists are introduced in the latter half. This threat puts Jojo and Caesar in jeopardy and forces them to train themselves like never before. Ultimately, the two arcs are separate entities but are quite an entertaining watch. Now, I probably haven't touched much on the topic of this as much as I should have been but perhaps the characters of the series are the most interesting aspects that connects the show together. Jojo is the dynamic titular character of the series which follows a generation pattern. I've already talked about the first generation but both Jonathan and Joseph Joestar shares many aspects in terms of personality. Both characters are fiercely loyal, passionate, courageous, loving, and always looks after other people's well-being above their own. Although lacking in depth initution or acumen, they both are often able to come up with strategies that catches their adversaries off on guard. In particular, it is their determination to protect what they hold dear that pushes them to be their best. Let's not get too attached though because the Jojo franchise also offers many other fascinating characters from its collection. Previous characters such as Erina and Speedweagon makes their returns to provide valuable assistance. More importantly though are the new characters that really makes this show shine. We have Caesar who viewers may see as a polar opposite of Joseph Joestar. Caesar is a man that is confident, casual, and often likes to hang around the ladies. In sharp contrast, he is a man that Jojo loathes at first. Yet later on, we can see that they get along quite well and even risks lives for one and the other. On a more mature side, there is also Lisa Lisa, a deadly beauty to the eye who provides invaluable aid to Jojo and Caesar. Like most battle shounens, there are the antagonists. In the first arc, there's Dio. The second half introduces a trio of antagonists known as the Pillar Men. Their elemental powers pushes the duo of Jojo and Caesar over the edge and presents an intense challenge like they never faced before. It's also humorous to watch some of their random gags sometimes even if they are randomly peculiar; i.e. Wham's tendency to reflexively attack others when someone steps on his shadow, AC/DC's crying, and Cars' passion to protect living things (other than humans of course). The action of the series is ridiculous. However, I mean 'ridiculous' in a good way because the over exaggerated way it is being portrayed. Every attack is spoken directly with dialogue and a stamp of dynamic that is humorous, entertaining, delightful, and grabs interest to viewers. Who wants to just watch characters shouting resolves like “I'm going to save you, I swear!” all the time? In this series, the characters presents their attacks in an enthralling way that stimulates attention while often making jokes about the dialogues themselves. Some of the characters' names are parodies as well such as AC/DC that is based off the Australia band of the same name. Most of the male characters also are manly with their flexed biceps and strong attitudes. It contrasts some of the shows I've seen and presented in a more old school way. The female characters in the show are also well portrayed with their maturity rather than being a stubborn, jealous, or tsundere as of many today's anime series. As for the animation, the series has a edgy way of production. The artwork might not be what people see nowadays. In fact, it's more classic, nostalgic, and holds that old 1900's style. David Production (Level E, Inu x Boku SS, Dogs: Bullets & Carnage) handles the artwork and they did a beautifully good job in my opinion. It protrays the old 1800s well with the old school vehicles, Victorian style architectures, and some of the ancient artifacts. It's like going back in time and relieving those old school memories. The soundtrack of the series is also well performed. The first and second OP songs are very well orchestrated that is classic to the ears. Hell, I could set "BLOODY STREAM" by Coda on repeat all night long. It's not only entertaining to watch but also artistic with those manly poses from the main characters. Its definite old school theme sticks well is adapted. Likely wise, the ED song produces a similar feeling of that nostologia of the 1800's where adventures and collecting treasures are a source of many people's inspirations. Overall, this series gets a score of “9” from me. It has gar characters, that old school feeling, and very entertaining dialogues. It doesn't force itself either because all of them are spoken with humor as opposed for a purpose. The characters are appealing with their personalities and their interactions. From what I see, they are natural and falls in the case of a glorious presentation. The nostalgic music and artwork also gives fresh breath of cool air. No random fan service, no confusing plot twists, no cheap humor, no regrets. This series is definitely one hell of an adventure and worth your time.